One of the most popular dishes on the menu at Bar Shu, the London Sichuanese restaurant for whom I work as consultant, is 辣 子 鸡 or chicken with chillies. It’s originally a dish from Geleshan in Chongqing, and it’s guaranteed to shock on first acquaintance. A small chicken is chopped up, on the bone, into tiny pieces, marinated and deep-fried. It is then stir-fried with an improbable wokful of chillies and Sichuan pepper – so many that you have to fish around in a pile of scorched, fragrant chillies to find the pieces of chicken in the finished dish. It’s not actually as hot as it looks, and the chicken has a marvellous fragrance, but staff at Bar Shu always try to warn unwary guests that they are not supposed to eat the chillies. Hi, I have eaten this dish dozens of times. In my favourite restaurant,the heat varies sometimes between visits even though the dish is cooked the same. I think the heat varies according to the batch of Chilli’s used at the time. My (Sichuanese) girlfriend used to cook this for me and now I cook it for her using the recipe from your Sichuan cook book. I think your recipe is better! this is the stand-out recipe from Sichuan for me. I have seen many incarnations, but all were made with the longer, thinner red Thai chillies. 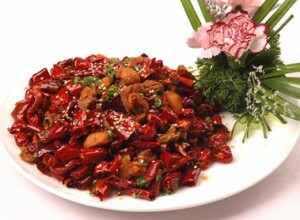 Your photo shows the rounder Sichuan chillies. I have unfortunately never been able to buy those, so I wonder how they compare in terms of hotness (i.e. included Capsaicin). When I order this dish, I do eat about two mouthfuls of the chillies in addition to the chicken. I like the taste, even if it burns. So I was a bit shocked to find out that you recommend to eat only the chicken. Is it dangerous to ones’ health to eat too much chillies? I mean apart from the burning mouth which I personally don’t have problems with.